Rescue 2: Everyday Heroes cd key is a digital product that must be introduced into a Steam account to begin the download. 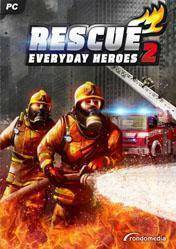 Rescue 2: Everyday Heroes is the exciting sequel to "Rescue 2013: Everyday Heroes", a game in which we will assume operational control of all firehouse. We will be the commander of the firefighters, and our mission is to ensure the safety of the city. We will have to keep improving our team, deploy specific equipment specialists and firefighter, and coordinate simultaneous missions using the city map. A variety of fire vehicles, a wide range of equipment and skilled personnel, and all kinds of materials to meet any threat to happen in our city. Remember that all stores have been verified by our team and are 100% reliable, you can also filter by official and unofficial stores the price list to select the store that suits you. There are no comments yet about Rescue 2: Everyday Heroes . You can be the first one! Rescue 2: Everyday Heroes - Episode 1 - Getting Started! !